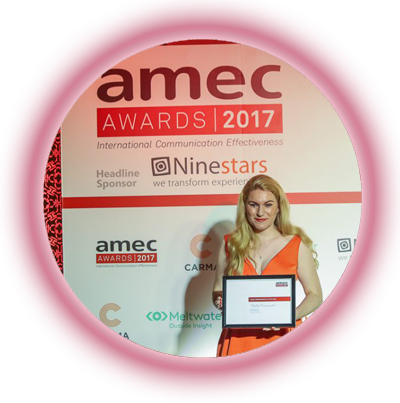 In a global industry first, Australian Publicist and PR professional, Alice Collins, was awarded Silver (Highly Commended) in the International Association for Measurement and Evaluation of Communication (AMEC) Young Professional of the Year 2017 Awards. 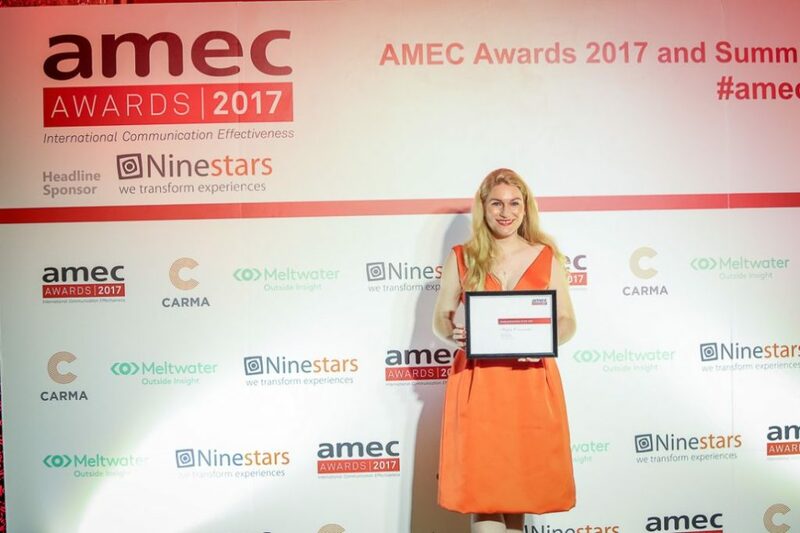 Alice Collins, Director of the boutique public relations agency, Insight Communications joined the industry’s finest from 35 countries competing in the prestigious Awards held at the AMEC Global Summit and Awards event in Bangkok. 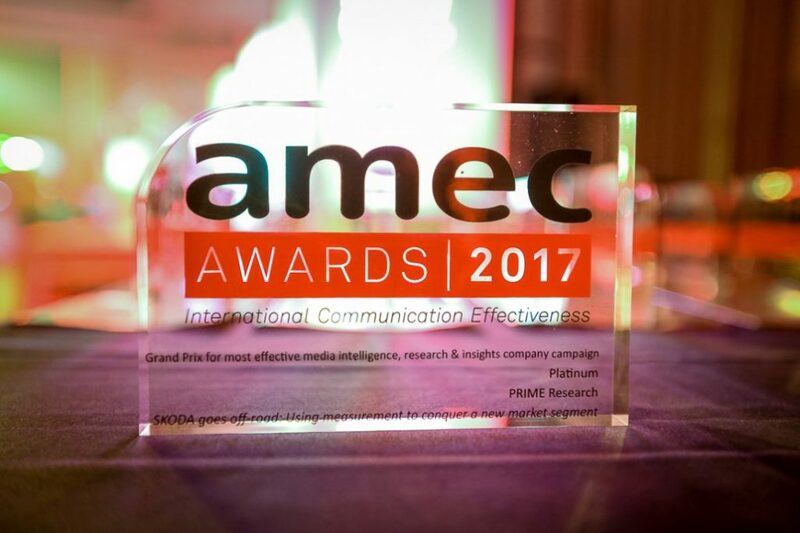 As the world’s largest professional body for communication research, media intelligence and insights, AMEC is the industry leader instigating research, best practice and the highest standards supporting consistent progression of the industry. Recognising the highest professional standards of current industry leaders in communication, measurement, evaluation and media intelligence; the international AMEC Awards also recognise excellence and the exceptional contribution of young professionals who demonstrate outstanding promise as future industry leaders. The only industry professional from a PR agency to be shortlisted in the AMEC 2017 Young Professional of the Year Award category, Alice Collins competed with five leading young executives, most from multi-national media intelligence agencies including; CARMA (Dubai, UAE), Insentia (Wellington and Wairarapa, New Zealand), Infomedia (Copenhagen, Denmark), Kantar Media (London, UK) and Mediaverse (Melbourne, Australia). With a record number of nominations and rigorous judging criteria the competition for this prestigious gong was fierce. 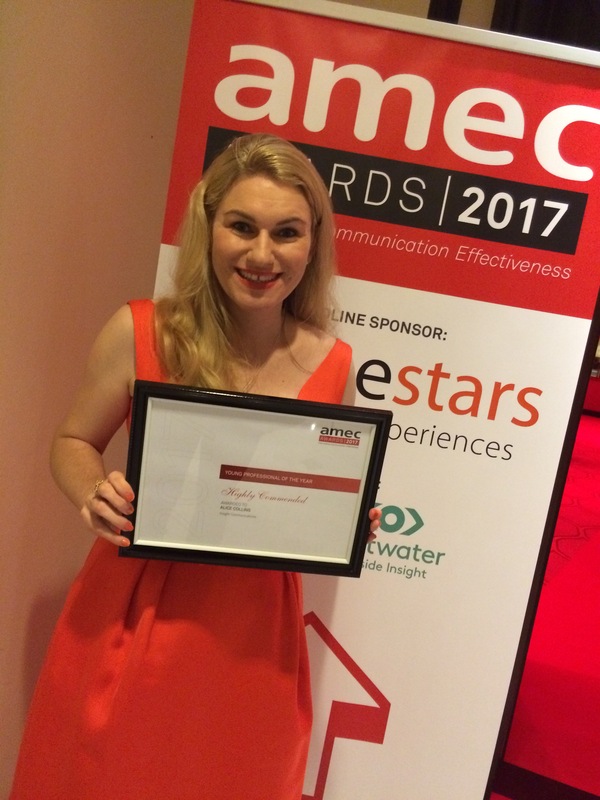 However, in an AMEC first, Australian PR professional Alice Collins took Silver (Highly Commended) in the Young Professional of the Year category with Gold (as in previous years) going to a media intelligence analyst. 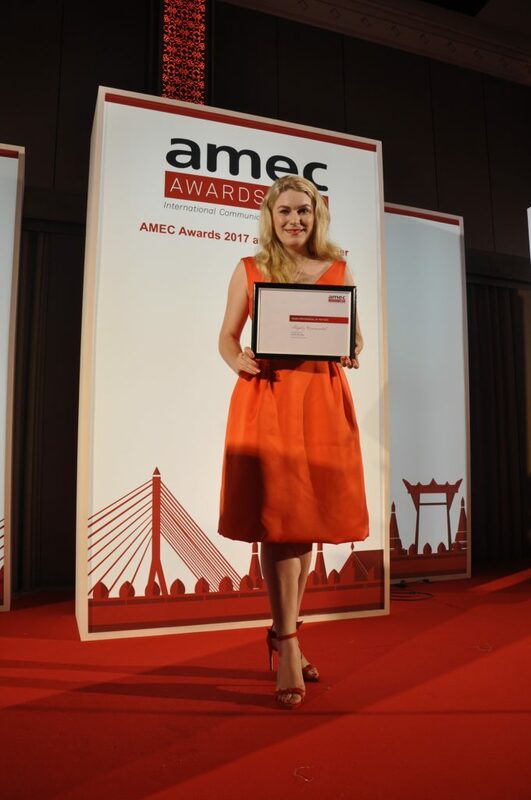 Barry Leggetter, AMEC CEO said, “Alice Collins has become the first public relations professional to win in the Young Professional category of the global AMEC Awards. “Congratulations Alice and kudos to Insight Communications for having the foresight to participate in the AMEC Awards. Insight were the only Australian PR consultancy to enter so double congratulations from me to them,” he said. “After Insight have paved the way, we hope that next year there will be more entries from Australia for what is the biggest industry awards scheme of its type for PR measurement,” Mr Leggetter said. In making industry history, Alice Collins said, “It’s extremely humbling to be the first PR practitioner in a field of media intelligence specialists to be recognised on a global scale for excellence in campaign evaluation and measurement. “Often overlooked, frequently underutilised and undervalued by PR agencies and their clients, the value of reporting on established pre-determined measurement frameworks in the strategic development, execution, measurement and evaluation of PR campaigns is critical to the overarching structure of each and every campaign Insight creates and delivers,” Ms Collins said. “Our philosophy is that you don’t have to be an environmental scientist to save the planet. You don’t have to be a politician to improve outcomes for the disadvantaged; and, you don’t have to be a doctor to save or change lives. You just need to be an effective PR practitioner with a passion for achieving and reporting communication excellence to have a positive impact in changing the world for the better… one piece at a time…” she said. Clare Collins, Managing Director of Insight Communications said, “Receiving global peer recognition is an extraordinary achievement for any young professional, no matter what their field. For Alice, this record-breaking award recognises her extraordinary professionalism that is driven by her passion to create awareness that increases community engagement and improves widespread understanding of serious issues. “This is what drives Alice to consistently achieve excellence across all Insight’s multi-award winning (paid and pro-bono) campaigns including; Asbestos Awareness Week/Month, Ovarian Cancer Awareness Month, A Gift Like None Other (for Timorese physiotherapist Nuns) and the Where’s William? (Tyrrell) Campaign which also received recognition from Crime Stoppers NSW,” she said. Between 2010 and 2017, Alice and Insight have received 15 peer reviewed Australian and international awards including 12 Public Relations Institute of Australia (PRIA) and Golden Target Awards. Insight was also Australia’s first PR agency to receive both an AMEC and Global Alliance COMM PRIX Award (2014) with Alice being the youngest PR practitioner to receive a COMM PRIX Award at that time. In 2017, Alice is the first PR professional (globally) to win an award in the category of AMEC Young Professional of the Year. In June, Alice will present a masterclass on “PR For Good” at the 2017 Mumbrella360 conference. Winner (Gold): Lasse Skjoldan, Infomedia – Senior Advisor, Infomedia, Copenhagen, Denmark – The leading Danish media intelligence agency. Highly Commended (Silver): Alice Collins, Director, Insight Communications, Sydney, Australia – The multi-award winning public relations agency specialising in cause, culture, community, health and government awareness and education campaigns. CARMA – Mania Abboud (Senior Relationship Manager, CARMA, Dubai, UAE) – A multinational media intelligence agency with 13 international offices covering 80 languages and 41 countries globally. Insentia – Alex Gyde (Senior Analyst, Insentia, Wellington and Wairarapa, New Zealand) – Australian based multinational media monitoring and analysis agency with 18 offices across Asia-Pacific, Europe and the US. Kantar Media – Georgie Bents (Research Consultant. Kantar Media, WPP, London, UK) – A global media and market research company with offices in the UK, Ireland, Europe and the USA. Mediaverse – Sally Chadwick (Senior Account Manager, Mediaverse, Melbourne, Australia) – The media research and analysis division of Australian Associated Press (AAP). Full list of AMEC Award Winners.